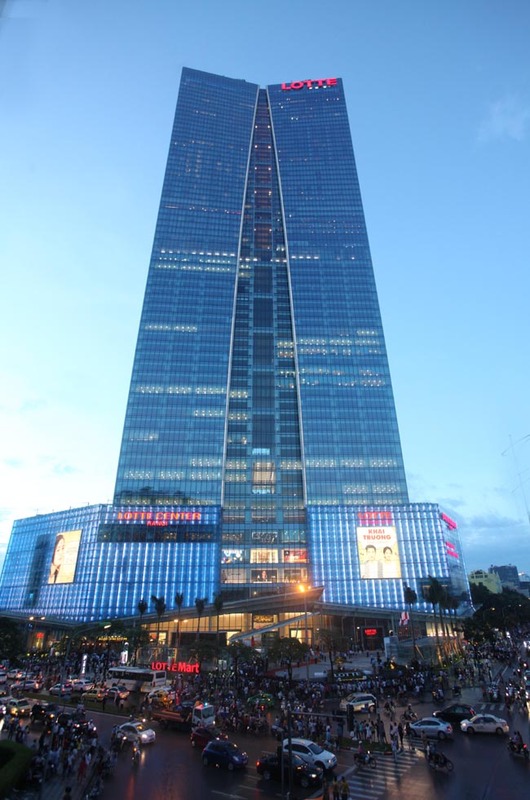 HA NOI (VNS) — High-rise skyscraper Lotte Center Hanoi held its official grand opening ceremony yesterday. Built in the style of the Vietnamese traditional ao dai, the 14,000 sq. m. building also incorporates advanced construction technology from South Korea and features 70 floors with offices, shops, serviced residences and five-star hotel rooms. The building was a symbol of friendship and represented the effective relationship between Viet Nam and South Korea as well as between Ha Noi and the Korean capital of Seoul, said chairman of the Ha Noi People's Committee Nguyen The Thao. The building represented the group's commitment to contribute to the economic development of Viet Nam, Lotte Group President Shin Dong Bin said, stressing that the construction of the building had created employment for Vietnamese labourers and promised that the completion of the building would continue to offer jobs for the locals. 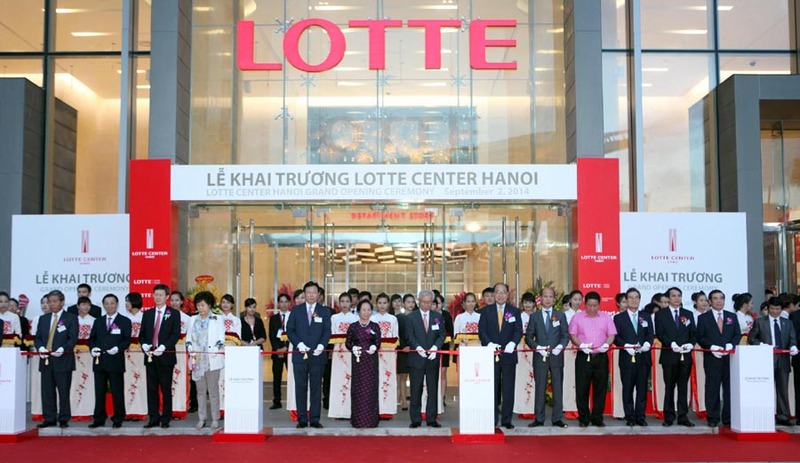 Thao urged the Lotte Group to operate the building efficiently, so that it could serve the needs of Vietnamese and foreign residents and bring value to the capital. He also hoped the group would expand investment in Ha Noi and throughout Viet Nam. The building in Ha Noi would serve as a stepping-stone for Lotte Group to reach other Asian markets, Lotte Center Hanoi General Director Lee Jong Kook said at a press briefing about the opening of the centre. "Viet Nam is one of Lotte's strategic markets. The construction of the 65-storey Lotte Centre Hanoi underlines the importance Viet Nam has in our global strategy," he said. He emphasised that the building benefited the local economy by generating over 1.8 million jobs in the course of the five-year construction period, in addition to the planned hiring of 3,000 regular employees responsible for the building's upkeep. Moreover, the construction process itself stood out as exemplary in terms of workplace safety. "What is especially worthy of notice is that the multi-complex building will be a symbol of Korea's noteworthy construction abilities, as it left the unprecedented record of having zero accident casualties in its 18 million hours of construction," he said. The construction process of the luxury skyscraper also set an example for the country in terms of sustainability by following environmentally sustainable practices, the general director said. Eco-friendly construction materials were used throughout the building, and electricity systems relied on advanced technology to save energy. The list of retail establishments in the building includes two major anchors, the basement-level Lotte Mart and six-storey Lotte Department Store. The building also includes 258 office spaces and serviced residences and 318 hotel guest rooms, as well as an observation deck and skywalk on the top floor offering a panoramic view of the city. Visitors to that floor can dine at open air restaurant Top of Ha Noi, which sets the ambitious goal of joining the ranks of the capital city's top culinary destinations. Despite the current economic slowdown, particularly in the real estate sector, the general director was optimistic about the building's prospects. "Our targeted customers are high-end visitors and VIP guests, who are not very sensitive to economic fluctuations," he said. "Given that we offer high-end luxury services, we see no problems ahead." Besides, given the nature of the economy, he predicted that the slowdown would soon reverse its course. "Economically speaking, the economy normally develops in a way similar to a sine graph, which means it goes up and down," he said. The opening of Lotte Center Hanoi could even rouse the quiet market, said Vu Dinh Trung, CEO of the Ha Noi-based VietHomes Real Estate JSC, which specialises in housing services for foreigners. "With its long-standing name, experience and financial resources, it will not be difficult for Lotte to operate such a multiplex building," Trung said. Lee Jung Youl, Vice President of Lotte Hotels and Resorts and General Manager of Lotte Hotel Hanoi, said that the centre aimed to introduce a new standard of five-star hotel rooms as well as hotel-like serviced apartments to the capital. "We will provide services in MICE (meetings, incentives, conferences and exhibitions)," he said. Trung said focusing on high-end services was a good strategy as the market for serviced apartments, though competitive, had a lot of potential. "At the moment, many investors in Viet Nam have changed from buying apartments to renting serviced apartments," he said. "Considering the experiences of our customers, many of whom are high-end customers from Japan and South Korea, I think Lotte has many advantages in this market."